Incredible view of Kentucky Lake and the western shore of Land Between the Lakes (LBL). 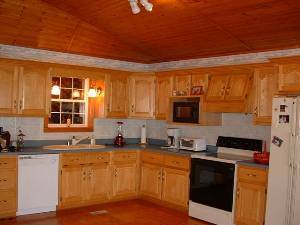 This home has a vaulted ceiling on the main level where the kitchen and great room are located. Two bedrooms with two baths plus a laundry room are located downstairs. 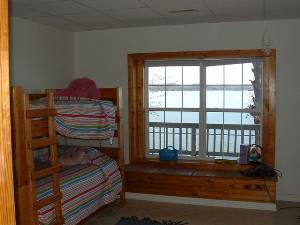 Both bedrooms have a lakeview. 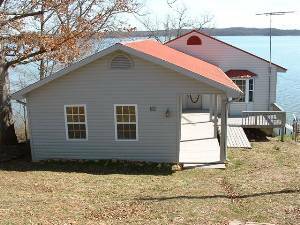 An attached annex to the main level includes a large bedroom and bath with a whirlpool tub. 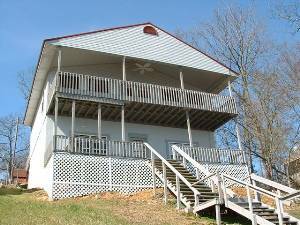 Both levels have full length, covered decks, providing the perfect place to enjoy the beautiful view. Utilize the sleeper sofa and this house will sleep 8 persons. 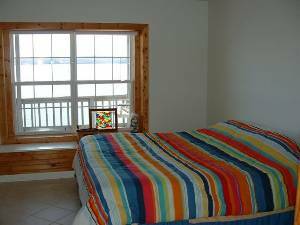 Enjoy boating, fishing, swimming and sunbathing on the private dock, which features deep water year round. 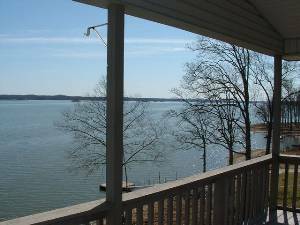 A boat ramp is located 50 yards from the house, perfect for fishermen and boaters. Satellite TV service is included. 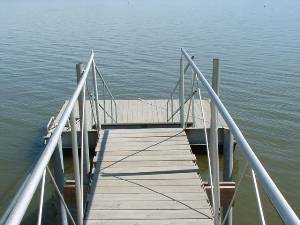 Private dock on lakeside and boat ramp within 50 yards. This is a special retreat for people who seek soothing scenery. When you look out across the water, you see a horizon of quietude -- an island (National Recreation Area-Land Between the Lakes) on which we saw no other residences. 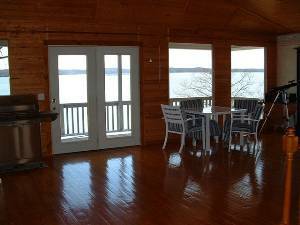 The windows in the kitchen/great room overlook water with so many interesting birds flying past including blue heron, osprey, even eagles on lucky days! The dock on the river is fun for swimming during the day and is a relaxing place to watch the moon at night. We have stayed here twice and look forward to visiting again! $350 deposit required at the time of reservation; refundable up to 30 days prior to reservation. All refunds carry a 25% service charge. Balance is due 7 days prior to check-in. Occupancy of 8 people. There will be a charge of $10/day for each additional person. Because of popularity of this property, early booking is suggested. Deposit: $350 damage deposit at time of reservation; full amount of rent due 7 days prior to check-in. Cancellations and Refunds: 25% service charge on all refunds; refundable up to 30 days prior to reservation.